Educating yourself to know the differences between Retirement Villages and Freehold Lifestyle Villages is crucial. A retirement plan based on building assets rather than spending savings is the first step to living the lifestyle you deserve. Freehold titles are the best alternative to existing models, inherently superior to Licence to Occupy arrangements or Life Interests. 10% deposit is required to secure the build, nothing more until completion. Depending on your finance arrangements, this would take the form of equity in your home. Each year, the Barton Fields Residents Committee will work with the Body Corporate Manager to compile a budget for the operational costs of running and maintaining the village. This is divided by the number of villas, and a weekly fee per villa is derived. The only other additional costs would be individual villa utilities, telephone and rates. 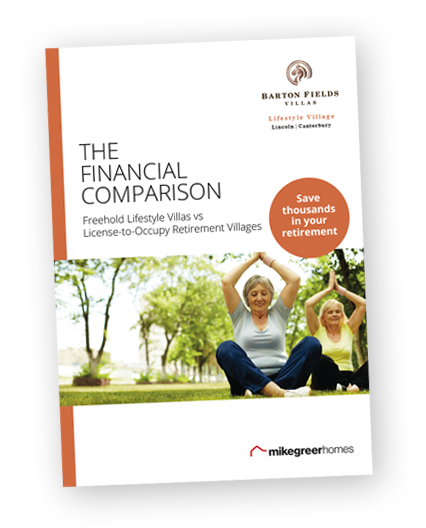 Get the full list Barton Field Villas frequently asked questions Retirement villages versus Freehold lifestyle to learn more about the benefits of Freehold Lifestyle Villas. To speak with a sales agent contact Barton Field Villas to discuss your freehold lifestyle villa. Mike Greer Homes offers you the latest in appliances, finishes and colour palette, add the landscaped gardens and you have the reason why Barton Fields Lifestyle Villas is becoming the number one choice for active over 55s looking for a new home in Canterbury. Click here to see other Barton Fields Lifestyle Villas.